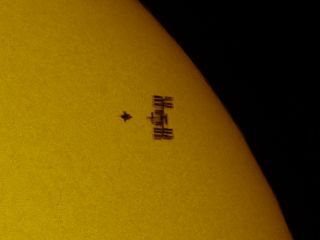 This close-up of photographer Thierry Legault's snapshot zooms in on the space shuttle Atlantis and International Space Station as they transited across the sun on May 16, 2010. This photo was taken from Madrid, Spain. Full Story. An eye-popping new snapshottaken by a Florida photographer has caught the International Space Station andshuttle Atlantis in silhouette as both spaceships crossed in front of the sun. Photographer Thierry Legault tookthe stunningphoto on May 16 from Madrid, Spain at 13:28 GMT (9:28 a.m. EDT) shortlybefore Atlantis docked at the space station. In the photo, the shuttle andspace station can clearlybe seen as two separate spacecraft. They appear as darksilhouettes in the upper right region of an otherwise bright yellow sun. Eventhe wings of Atlantis can be discerned along with the station's expansive solararrays as both flew 200 miles (354 km) above Earth. When Legault took the photo,Atlantis was flying below the space station and about to perform an orbitalback flip so astronauts inside the station could snap high-resolution photos ofthe thousands of heat-resistant tiles lining the shuttle's belly. Catching the scene is can beextremely tricky, Legault said. "For me, besides havingthe right equipment for such a shot, the difficulty is to be perfectlyprepared," Legault told SPACE.com in an e-mail. "This includes a lotof training and serious preparation." It took just 1/2 a second forAtlantis and the space station to zip across the face of the sun. The solarcrossing, called a transit, was only visible from a 3-mile (5-km) wide corridorbeneath the flight path of both spaceships, Legault said.? "The excitement is likeduring a total eclipse, except that the [viewing corridor] is much smaller andthe duration too," Legault explained. "So there is no chance ofmistake. The possibility comes once only and if you miss it, it's over." Legault learns of spacecrafttransits from the website Calsky.com, which forecasts exactly when the eventsare visible and from where. He then carefully synchronizes his clock toCalsky's and heads out to the viewing area, which he selects using Google-Earthmaps. Weather forecasts for theregion play a big part is selecting a prime viewing area, he explained. When the actual transit timecomes, Legault is not even looking through the camera. He looks at the clock, andthen hits the shutter button to try and catch the spacecraft in flight. "Also,there is a big excitement when I check all the images of the sequence ? to seeif the space ship appears on one or two images (it cannot be on more thantwo)," Legault said. "At this moment, the image is just here for meand I can enjoy, before publishing it." Thereare several chances for skywatchers in the United States see the shuttle and space stationtogether with their unaided eyes. The two spacecraft have been docked since May16 and can appear as bright as the planet Venus, weather permitting, toobservers on Earth who know where to look. [How to spot theshuttle and station]. This isn't the first timeLegault has captured the space shuttle Atlantis' silhouette as it flew beforethe sun, but it might be the last. Atlantis' current mission todeliver a Russian room and spare parts to the space station is the orbiter's32nd and final planned spaceflight. NASA plans to retire Atlantis and its twoother shuttles after just three more missions, including this one under waynow. Legault last photographed Atlantis in front of the sun in May 2009, when it pulled up tothe Hubble Space Telescope during NASA's final visit to overhaul the famedspace observatory. Legault had watched Atlantis blast off from NASA's KennedySpace Center in Florida a few days earlier. "Atlantisis not especially my favorite for such shots, it's chance," Legault said,but added that Atlantis does feel special because he saw it launch in personlast year. "And it's all the more special because it's its last flight.